‘Travel first leaves you voiceless, before it turns you into a storyteller’, according to Shams ad-Din Abu Abdullah Muhammad ibn Ibrahim ibn Muhammed ibn Ibrahim ibn Yussuf al-Lawati at-Tanji, the 14th century traveller and qadi (judge) known as Ibn Battuta (‘Son of the Little Duck’). His travels are captured in the famous rihla (travel narrative) he dictated to Ibn Juzayy al-Kalbi in the early 1350s. This double album with accompanying book spans episodes from this rihla over the course of two live concerts – 1304-35, recorded in 2014 in Abu Dhabi with English narration, and 1335-77, recorded in 2016 in Paris with French narration – and was inspired by a new translation: Travels of Ibn Battuta by Margarida Castells and Manuel Forcano (2005). Like Ibn Battuta’s rihla, Jordi Savall’s musical journey offers a voyage through a somewhat idealised Orient, one held to be the cradle of knowledge, culture and religion in the 14th century. 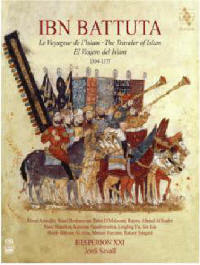 To early music specialists with a Western gaze, this is an era normally dominated by the French poet and composer Machaut; but Ibn Battuta had a different gaze, one turned towards ‘the orbit of Muslim culture and religion’, as Castells and Forcano explain. Therefore Savall creates a musical quilt spanning Tangier to China, calling on oral and improvisatory traditions with appropriate historical lineage. If the rihla was ‘a showcase for the world in all its complexity’, then Savall’s programme supplies a fitting musical counterpart. Consider the opening sequence: the narration announces Ibn Battuta’s birth in Tangier accompanied by Driss El Maloumi’s oud improvisation. Next Ahmed Al Saabri sings Bismillah ir-Rahman. More narration, accompanied by the Madagascan valiha virtuoso Rajery, describes the Muslim empire of Mali before both oud and valiha join for a lively instrumental piece, Kouroukanfouga. Savall then plays Lamento di Tristano on the rebec, marking the death of Marco Polo in 1324, before voyaging out through the port of Venice and eastwards for Katerina Papadopolou’s haunting Greek Lament. The next sequence follows Ibn Battuta through North Africa and Damascus as he journeyed towards Mecca. At each turn Savall evokes the atmosphere of a time with results more cinematographic than drily historical. Such a diverse programme and impressive cast of musicians will surely inspire every listener with a sense of wanderlust. Yet it is perhaps the subtext of this album – travelling through the world before modern borders – which is the most poignant part of Savall’s message for us today.